Habit: Plant hairy. Stem: 1--3 cm, not glandular. Leaf: 2--5 mm, oblong, lanceolate, or narrowly oblanceolate, entire. Inflorescence: cluster, dense; flowers +- sessile. Flower: calyx tube < 1 mm, membrane +- = but not connecting lobes, ciliate; corolla 3--5 mm, white, lobes 1--2 mm, wavy, recurved, base with 1(2) red spots; stamens attached at tube base, equal, exserted, pollen yellow; style +- exserted. Fruit: < calyx, widely ovoid. Seed: 6--16, not gelatinous when wet. Chromosomes: 2n=18. Ecology: Sandy washes, flats; Elevation: 900--1100 m. Bioregional Distribution: DMtns (Little San Bernardino Mtns), DMoj exc DMtns (sw corner), w DSon. Flowering Time: Apr--May Note: Threatened by development. Citation for this treatment: Robert Patterson & J. 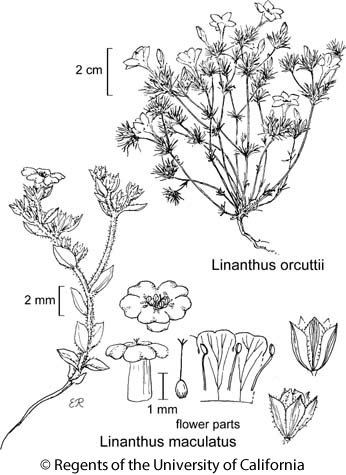 Mark Porter 2015, Linanthus maculatus, in Jepson Flora Project (eds.) Jepson eFlora, Revision 3, http://ucjeps.berkeley.edu/eflora/eflora_display.php?tid=31034, accessed on April 20, 2019. DMtns (Little San Bernardino Mtns), DMoj exc DMtns (sw corner), w DSon. Markers link to CCH specimen records. Yellow markers indicate records that may provide evidence for eFlora range revision or may have georeferencing or identification issues. Purple markers indicate specimens collected from a garden, greenhouse, or other non-wild location.